Stardust Crusaders knocked it out of the park! Replaced lengthy review-ish description with a generic one. Rockman 7: Shukumei no Taiketsu! Mega Man 7 is an action platformer game for the Super Nintendo. Back on his 7th adventure, Mega Man needs to defeat Dr. Wily again with another 8 powerful Robot Masters, plus the mysterious black armored robot, Bass and his robot dog Treble. 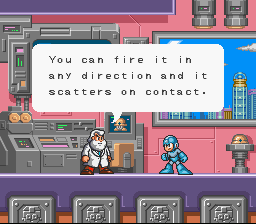 The gameplay is the same as the first NES games; defeat Robot Masters and get their powers, which Mega Man can use to reveal secret paths in every stage. 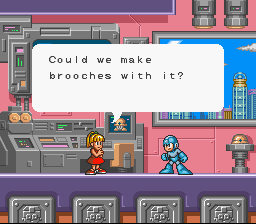 The game has the Eddie Shop where Mega Man can buy powerups and other items. 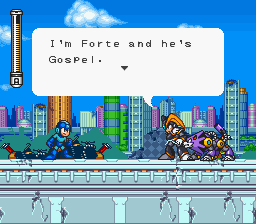 This is an English translation for Rockman 7 - Shukumei no Taiketsu. Don’t confuse this for Megaman VII! The US ver. had excluded many in-game perks from the JP ver., like the Lab Talk with Roll and Rightot(Auto) and the minor subs on Robot Master stage select. I also edited some of the game’s sprites, esp. Rockman’s Rush Armor. 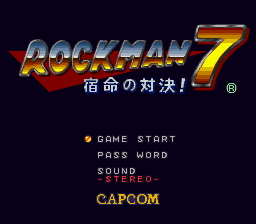 The patch should be applied to a headerless version of Rockman 7 - Shukumei no Taiketsu! (Japan).